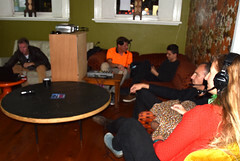 Telematic Cafe: On Air, 6 May 2016 as part of Geelong After Dark (GAD). 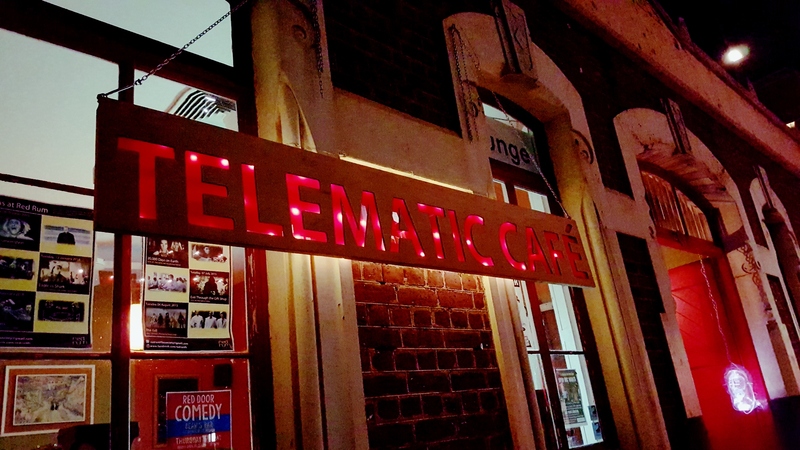 View photo-documentation on Flickr – Telematic Cafe GAD. Thank you to the Geelong After Dark co-producers: City of Greater Geelong and Diversitat and the venue owners/managers. Telematic Cafe: On Air welcomed 400 visitors during the four-hour event (6pm to 10pm). 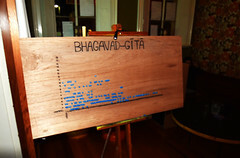 Thank you goes to team members Terry Guida, Stephen Juhasz, Matt Gogarty, Darby Hewitt, Toki Babai, and Cal Lee for smooth running of Radio Whispers (Bhagavad-Gita)! Special thanks to THE PULSE 94.7FM coordinator Leo Renkin for making this project happen. In the cosy back room of Telematic Cafe (Beav’s Bar) the participants could put the 3D glasses on and traverse the night-time Tokyo through the immersive and poetic world of Shadowland – award-winning work produced by Kazuhiro Goshima with single 2D camera. Thank you to Ray Luke for providing screening equipment for this work. 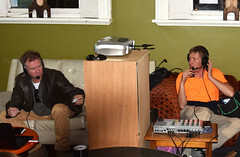 The other side of Telematic Cafe: On Air was occupying the empty shop across Little Malop street, opposite Beav’s Bar. 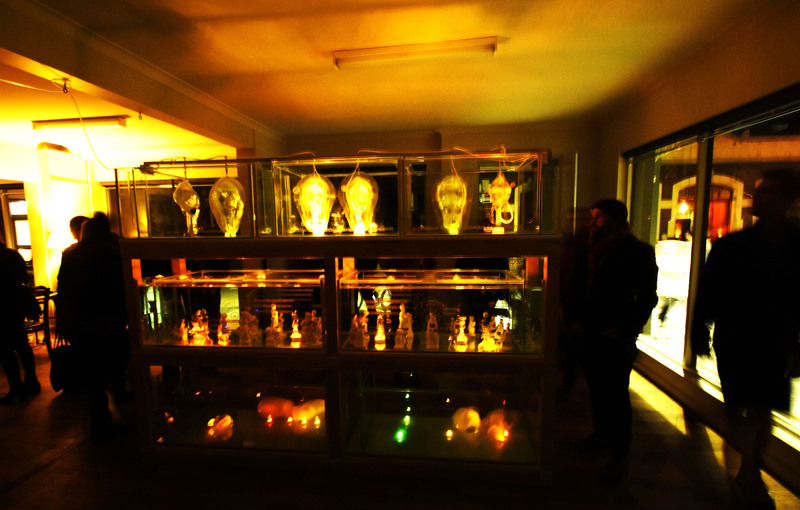 In here, the GAD participants encountered Michael Morgan’s installation Symbiotic Illusion – created for the GAD night. This elaborated structure referred to the illusion of symbiosis and contrived human ideals, and was composed of glass fish tanks containing illuminated figures of heads (in ice and plastic), and water environments featuring salon-like scenography made of ceramic figurines. 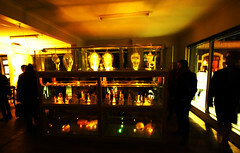 Part of the room, behind the large shop windows, was an exciting pop-up off-site for Deakin Motion.Lab. Here, the GAD participants experienced a great night of “dancing a duet” with VR / artificially intelligent partner – trying out and contributing to Duet created by Motion.Lab’s artists-researchers. For the duration of four hours artist Stephanie Andrews was engaged in continuous talk and answering of questions about the function of Duet, whilst participants immersed in the work. She was joined by fellow artist John McCormick. What a night! Telematic Cafe: On Air was extraordinary and gained a lot of amazing response and incredible level of participation! Thank you to all who joined in and see you in the next event! This entry was posted in Events, New Events. Bookmark the permalink.